The modernisation will equip the fighters with a new onboard radar system which is compatible with the similar system used in the carrier-based MiG-29K fighters already supplied to India. The Indian Air Force will continue operating the MiG-29 fighters it acquired at the end of the 1980s and in the early 1990s until at least the end of the next decade. India has embarked on modernising its Soviet fighters under the MiG-29UPG programme. The main objective of the modernisation is to bring the fighters up to the capability level of the MiG-29K and the MiG-29KUB, which are currently being supplied to the Indian Navy. The purpose of the basic versions of the MiG-29 fighter is only to gain superiority in the air, while the modernised MiG-29UPG planes will be able to attack ground targets and ships – both stationary and moving – at any time of day or night and regardless of weather conditions. 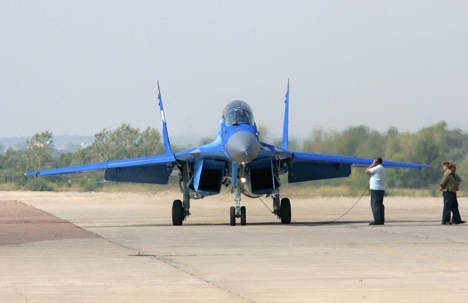 The Indian Air Force has been equipped with MiG-29 tactical fighters since 1987. India acquired a total of 80 fighters of this type from the USSR and Russia, including 70 single-seat MiG-29Bs and 10 two-seat MiG-29UB trainers. Delivery of the first batch of 44 aircraft began in 1987, the second batch of 26 fighters was supplied in 1989, and the third batch – a further 10 planes – was supplied in 1994. Fighters of this type are serving in three squadrons of the Indian Air Force: in Numbers 28 and 47 since December 1987 and in Number 223 since November 1989. Since then, 11 planes have been lost in crashes and air accidents (four fighters are known to have been lost in crashes, and a further seven in other accidents). A total of 69 planes of this type remain in service with the Indian Air Force. Talks on supplying the Indian Air Force with what was then the latest MiG-29 fighter began in the mid-1980s. Between 1986 and 1995 India acquired 80 of these planes. The deal was intended to counteract Pakistan’s purchase of American F-16A fighters. The Indian military regarded this purchase as very significant at the time. But by the end of the 1990s, the MiG-29 had been overshadowed by the ambitious programme to supply Su-30 fighters. These heavy multirole aircraft today form the core of the Indian Air Force’s strike capability. Nevertheless, the MiG-29 continues to fulfil its combat role in India’s skies. At the same time, the contract to acquire a carrier-based version, the MiG-29K, for the Indian Navy has given a boost to the modernisation programme for the land-based fighters already in service. The passing of time has already reduced the number of MiG-29 fighters, and it has been decided to modernise those that remain. A number of experts have cast doubt on the appropriateness of the MiG-29 modernisation programme, citing the plans for India to acquire 126 Rafale fighters. But the difficulties which are forecast to arise when it comes to assembling these fighters under licence and starting to deploy them are forcing India’s top brass to consider maintaining the combat capability of fighters acquired back in the 1980s and 1990s. India’s MiG-29 tactical fighters will be upgraded to the MiG-29UPG version under a contract signed in 2009. The price of the deal agreed between the two countries is estimated at $900 million. Russian Aircraft Corporation MiG is representing the Russian side in this deal. The modernisation programme will bring the fighters’ service life up to 40 years. The planes will be given new onboard avionics equipment and also new Zhuk-M radar. This onboard radar is capable of detecting up to 60 different airborne targets at a range of up to 200 km. Modernisation of the first six MiG-29 fighters for the Indian Air Force has already started: the planes will be modernised at the MiG Corporation’s Sokol aircraft factory in Nizhny Novgorod. At the same time the other 63 fighters will be modernised in one of India’s air force’s repair plants. Sets of equipment supplied by the MiG Corporation will be used at Indian plants. The modernisation will equip the fighters with a new onboard radar system which is compatible with the similar system used in the carrier-based MiG-29K fighters already supplied to India. It is reported that the MiG-29UPG’s onboard equipment will include modern systems built by the Indian corporations Hindustan Aeronautics Ltd and Bharat Dynamics Ltd, and also systems and instruments manufactured in France and a number of other countries. In addition to the new onboard equipment, the modernised tactical fighters will be fitted with an expanded range of weapons. There are also plans to upgrade the aircraft’s propulsion system and airframe. At the same time the planes will be equipped with an air-to-air refuelling system, and the aircraft’s fuel capacity will be increased by the use of an attachable external fuel tank located behind the cockpit. These changes have increased the fighter’s range by 1,000–1,500 km. The modernisation concept for the Indian MiG-29s is the same as that used for Russia’s MiG-29SMT programme. These fighters have been in service with Russian air force units since 2009 and are already being used successfully by pilots. When the onboard avionics system was created for the MiG-29UPG fighter, the production systems of various countries were integrated (“international avionics”) at the request of the customer. This kind of approach has a long history and has proved quite successful, in particular in the modernisation of the MiG-21UPG Bison fighter and the design and production of the MiG-29KUB and Su-30MKI fighters. The core of the new fighter’s armament control system is the Zhuk-M2E onboard radar, equipped with a slotted antenna array, designed and built by the Phazotron-NIIR corporation, and also the OLS-UEM infra-red search and track system, with thermal-imaging, television and laser observation channels, developed by the Moscow Precision Instrument Building Research Corporation (NPK SPP). Similar IRST and onboard radar systems are already in use in the carrier-based version of the MiG-29 fighter. The information management field in the cockpit is built on the basis of multifunctional full-colour liquid crystal displays. The “international” component of the fighter’s onboard radar equipment includes an inertial/satellite navigation system made by the French company Sagem, a French-made Thales helmet-mounted targeting system, an Israeli electronic countermeasures device and an Indian electronic support measures device (similar systems are used in the MiG-29K/KUB aircraft). The additional weapons on the modernised aircraft, as on the MiG-29K/KUB and 29SMT, will be RVV-AE medium-range air-to-air guided missiles with active radar seeker heads, and also precision-guided weapons for use against land and sea targets – X-31A anti-ship missiles equipped with active radar seeker heads, X-29T general purpose missiles equipped with tele-visual homing heads, X-31P anti-radiation missiles with passive radar homing heads, and also KAB-500Kr TV-guided glide bombs. First published in Russian in Voennoe Obozrenie.